Anyone who has visited Oliver Braid's Tiny Tumble will know that his life and art are inextricably linked. While this is true for a lot of artists, with Braid it can be hard to know if there is a distinction to made between the two at all, especially as his work becomes ever more project-centred and less about making physical objects. For The Old Mechanics Braid has shifted his and our attention to other artists, namely those who bypassed a formal art education in order to 'spend their life being useful to others'. By shining the spotlight onto artists not participating in Edinburgh Art Festival, Braid's project raises questions about how art is viewed and valued in society. Can, for instance, artists be 'real' artists if they haven't been to art school? (Of course the answer is yes, but often people are uncomfortable identifying as an artist unless they've studied art). Is it possible to flourish outside the institutional framework of schools and galleries? What makes someone an outsider artist? And vitally, what motivates people to make art if not the success and prestige? The seven artists selected by Braid each have a different story to tell and each tells us something different about what it means to be an artist. For John Sumpter, the art world is a fantasy world, and making art is a source of escapism. Throughout his career as a mechanical engineer he was drawn to detail, preferring the theoretical side of the job as opposed to the hands on. As in his engineering job, Sumpter has given his all to being an artist, and has produced a staggering 90 artist books that log his career as a conceptual photographer. It is important, he says, to continue challenging yourself, to always be thinking of the next thing on the list. Art is a way of making life meaningful. A retired social worker, Joan MacLellan isn't yet comfortable calling herself an artist. For as long as she can remember she has been interested in textiles, and growing up she was adept at making her own clothes. When winning a sewing prize as a child her mother told her: 'They should have given it to someone who couldn't do anything else!' The prevailing view that creativity was somehow second to academia meant Maclellan didn't pursue a career in the arts. Finally she can begin to take pride in her talents: recently her work has been shortlisted for the Cordis Prize and the annual RSA open exhibition. Though Aileen Grant went to art school, it was to study for a vocational diploma. She was attracted to the town-planning course at Duncan of Jordanstone (a course that no longer exists) because it was creative and incorporated other practical subject areas like politics, architectural, sociology and geology. Grant gradually came to being an artist as she moved closer to retirement, but while the stress-levels have eased since leaving her town-planning job, her current workload is equally demanding. Grant's studio is based in Edinburgh, but she makes frequent visits to the Highlands where she helps run Lochcarron Gallery. 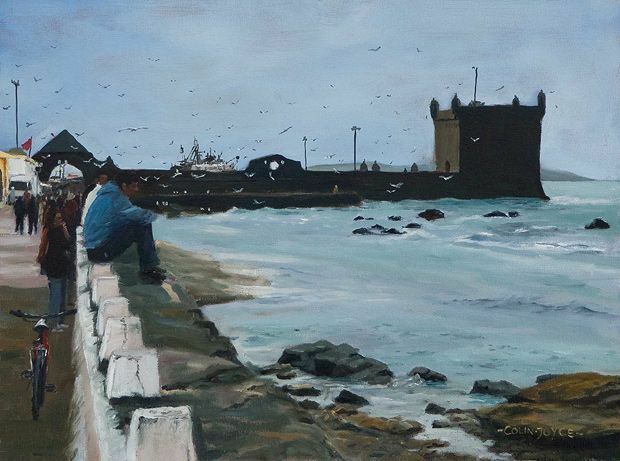 Colin Joyce maintained an interest in art throughout his 38-year career in the financial sector, but it wasn't until 2013 that he took up painting full time. His studio is in Dunfermline, but his work takes him all over the UK and beyond. A great lover of the outdoors, the transition to becoming a landscape painter has been relatively easy since retiring from his high-pressure job. As part of his practice he conducts workshops internationally and organises frequent group painting trips. Joyce also enjoys crafting useful objects including these ingenious wet panel carriers. Lel Blair has been surrounded by art and artists her whole life. When she was a teenager she would sneak into art lessons at Chelsea College of Art with her friends. Despite this, she was only prompted to become a full-time artist after suffering an injury that saw her opt for early retirement. As a left-hander, Blair was forced to consider her options after damaging her left arm and decided to 'turn a threat into an opportunity' (a phrase she heard often while working in senior management) and take up painting with her opposite hand. This forced a tension in her work that she continues to use to her advantage. After years spent working in management for the NHS, Karen Shewan took early retirement to reconnect with her creative side. She'd always had an interest in art, but like so many teenagers deciding what to study at university, Shewan erred on the side of caution and opted to study science. Having enjoyed a full and rewarding career, she is now making up for lost time studying at Edinburgh College of Art. Shewan also makes Buddhist-inspired mandalas, and in 2015 she and her partner Mel raised money for charity with a site-specific work at the Nomads Tent shop in Edinburgh. Mel Shewan doesn't consider himself to be a professional artist, and unlike his wife Karen, he never considered the possibility of studying fine art. A teacher of history, English and drama, he became an artist after years spent collecting fine art prints. After signing up to workshops at the Edinburgh Print Studios to better understand what he was buying, he became so enthralled by the processes that he began making work of his own. Though he is thrilled when someone buys one of his works, Shewan insists he does it for the love of it, and will continue making art unconditionally. Antisocial Sculpture, City Art Centre, 27 Aug, 1pm, free. Research project by Oliver Braid, investigating people who became artists after having been employed as something else.